The SIAI-Marchetti S.211 (later Aermacchi S-211) is a turbofan-powered military trainer aircraft designed and originally marketed by SIAI-Marchetti. Some 60 aircraft have been sold to air forces around the world. Aermacchi bought the production rights in 1997. Since the 1990s, the Philippine Air Force has been using the S-211 as a Trainer with secondary Attack Capability. These were redesignated as AS-211s and nicknamed as "Warriors".With the retirement of the F-5 fighters in 2005, the additional task of air defense was assigned to it as well. Because of this, the Philippine Air Force initiated some improvements to the AS-211s to improve its combat capability through a series of programs and innovations. Republic of Singapore Air Force (RSAF) - total of 32 aircraft including 24 assembled locally by Singapore Aircraft Industries and two former Haitian aircraft were acquired as attrition replacements.The aircraft were based in, and flight training undertaken, in Australia. 130 Sqn - 25 airframes in operational use (7 airframes were write-offs due to accidents).These were replaced by the Pilatus PC-21 from end 2008.After retirement, four were shipped back to Singapore being preserved for museum display and as educational/instructional airframes, while the remaining 21 airframes (including one airframe that had been used for spare parts) were sold off to International Air Parts (IAP) Group Australia Pty Ltd in 2009. 131 Sqn - disbanded in 1996, following the move of RSAF Flight Training School to RAAF Base Pearce in Bullsbrook, Western Australia, all remaining aircraft transferred to the former. The Alenia Aermacchi M-345 (M-311 before 2012) is a turbofan-powered military trainer aircraft. It is a development of the SIAI Marchetti S.211/Aermacchi S-211. Launched during the Paris air show in June 2013 with the backing of the Italian air force, the M-345 high efficiency trainer is due to replace the service’s current MB-339s during the delivery of pilot training. 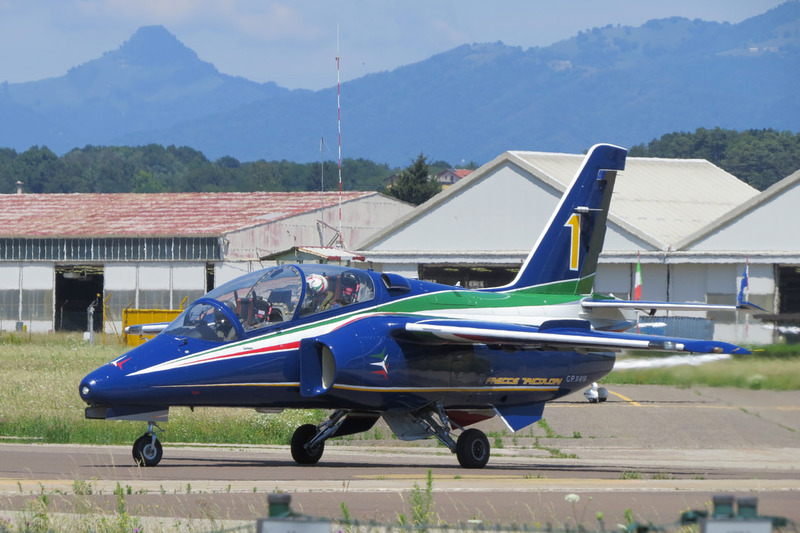 Deliveries are expected to commence during 2018, with the type to be used also to re-equip its Frecce Tricolori aerobatic display team.